In the first part of this 4 part blog, we reviewed how to “assess” what would be your “perfect Pre-owned inventory mix”. In the second part of this 4 part blog, we reviewed how to “find” your “perfect Pre-owned inventory mix”. In the third part of this 4 part blog, we reviewed how to “fix” or recondition your vehicles for maximum R.O.I. Now that we know what vehicles we are looking for and how to find them and how to fix them, the next step is how to sell them! Properly marketing and pricing your vehicle for sale is the key to a fast sale with maximum gross profit! Let’s talk about “on-line” marketing and pricing first. Once your vehicle is properly cleaned and reconditioned for sale, you have to take multiple pictures of the vehicle both inside and outside. Your perspective customer wants to see a LOT of pictures if they are viewing the vehicle on the internet. Make sure you include pictures of the mileage, tire tread depth and all angles of the vehicle inside and out! You should take a minimum of 20 pictures for each vehicle. Pay special attention to any upgraded factory accessories on the vehicle such as wheels, spoilers, roof racks…etc…..
Get the perspective customers attention with a solid and well written description! Produce a 60 second video of the vehicle! It not only provides a great marketing piece to help sell the vehicle, it also provides great SEO, (search engine optimization) for your vehicles on the internet! If you “tag” the video with the correct words it will show up in the search engines more easily and frequently! You can market your vehicles on a vast number of Automotive Pre-owned websites. First, pay attention to marketing them on your own dealership website! Once you get your dealership website set, get the vehicle out to as many automotive Pre-owned websites as possible! The more exposure you have, the quicker and easier it will be to sell the vehicle! Pricing the vehicle on the internet AND on the showroom floor should be the same! One sure way to upset a customer is to give them a price in the showroom that is higher than what they saw on-line! Seamless and transparent pricing policies need to be adhered to! Price your Pre-owned vehicles “to market”! Don’t just “add” $ ”X” to the cost of the vehicle to set your pricing. There are many software tools to help you understand what the average retail price of a similar vehicle is in your market. Whether you use “V-Auto, AAX, First Look…..etc….the information is very similar. The two most important pieces of criteria that a perspective customer is looking for in a Pre-owned vehicle are, price and mileage. Make sure that your pricing is in line with similar vehicles with the same mileage. Once the customer gets to your dealership to look at your pre-owned inventory, make sure your sales staff knows all about the different makes models and trim levels that you have available! When the customer walks into the showroom and asks, “What do you have in a 4 door import vehicle for under $12000.00?” you need to have a staff that is trained to give the customer a couple of different options within the first 60 seconds! Your staff needs to have an overall knowledge of what pre-owned vehicles you have available and at what price points they are available at! Marketing, pricing, knowledge of inventory and professionalism are important keys to selling a pre-owned vehicle! 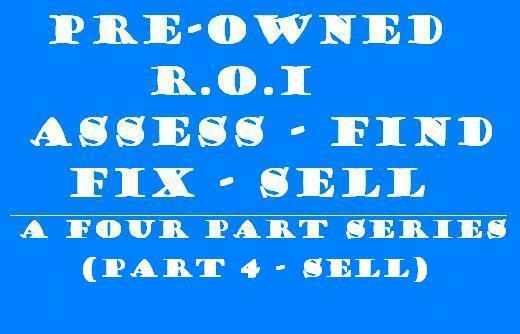 Assessing, finding, fixing and selling your pre-owned vehicles for MAXIMUM R.O.I. is essential to the overall success of the dealership!